Each year, Cycling Utah recognizes the top riders, clubs, events, and advocates for their accomplishments on and off the bike with our year end awards. Anne Perry (DNA Cycling p/b Plan 7) had an incredible season. She had numerous local and regional wins including the Bikes for Kids Stage Race, Porcupine Hill Climb, East Canyon Road Race , the omnium at the prestigious Iron Horse Classic in Colorado. She then won the Masters National Road Race in the 40-44 category. This led to an invite to Masters Worlds, where she raced to perfection, winning the World Masters Road Race Championship in the 40-44 category (see profile elsewhere in this issue). Anne Perry is the Cycling Utah Overall Rider of the Year. Alex Grant (Cannondale/Sho-Air) keeps on winning and winning (three more times). This season, he topped the Park City Point to Point for the fifth consecutive year. He finished second in the internationally prestigious La Ruta de los Conquistadores stage race in Costa Rica. He won two Intermountain Cup Races and the Draper 50 along with the US Cup Sagebrush Safari Marathon in California. He topped that off with a 5th in the Cross Country National Championships and a 3rd in the Marathon National Championships. Alex Grant is our Male Mountain Bike Racer of the Year. Haley Batten (Park City, Whole Athlete) is one of Utah’s rising stars. She won several junior races around the country including the US Cup Bonelli Park in California, the KMC Classic in Colorado, and the Subaru Cup in Wisconsin. She also finished second in the National Championship Short Track XC and topped it off with a win in the National Championship Cross Country race in the 15-16 year old junior category. Locally, she finished 4th overall in the Intermountain Cup Expert Women’s field, and to date has won all four races in the Utah High School Mountain Bike League series for Varsity Girls. She also finished second in the International MTB Races-Landgraaf in the Netherlands. Haley Batten is our Female Mountain Bike Racer of the Year. Logan Binggeli (St. George, KHS Factory Racing) had another stellar year this year. He topped the US Pro Mountain Bike Gravity Tour for the second year in a row with a win at the California Golden State GRT and second place at the Mammoth Kamikaze. He was also second in the national championship race, and topped the Flyin’ Brian Downhill in the Utah Downhill Series. Logan unfortunately broke his leg at the Red Bull Rampage at the end of the season. We wish him a speedy recovery. Logan Binggeli is our Male Downhill Racer of the Year. Amanda Batty (Park City, Go-Ride.com) topped the women’s pro field in the Pro Gravity Tour’s Mammoth Mountain Kamikaze, and locally in the Pomerelle Pounder and Sundance Showdown Utah Downhill Series. She was also second place in the Pro GRT National Series for the season and overall Utah Downhill Series State Champion. Amanda Batty is our Female Downhill Racer of the Year. Alex Grant (Cannondale) not only crushed it in mountain biking but also in cyclocross. In 2012, he won 3 races in the Utah Cyclocross Series, and the overall. Alex Grant is our Male Cyclocross Racer of the Year (2012 season). Evelyn Dong (Park City, White Pine Touring) is a speedster on a mountain bike and on a cyclocross bike. In 2012, she won 6 races and finished second 6 times on her way to winning the Utah Cyclocross Series overall title. Evelyn Dong is our Female Cyclocross Racer of the Year (2012 season). 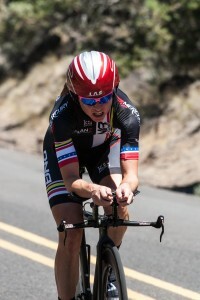 Katie Clouse (Park City, Cole Sport) is the future of cycling. She knows how to win, has a great time, and loves racing. Did I mention that she knows how to win? This year in road racing (she had a great year in other disciplines as well), she finished on top of the leader board in the junior fields (and in the 3/4 women as noted) in the Tour del Sol, the Antelope Island Classic Road Race (in the 3/4 women’s field), Colorado Mini-Classic Road Race and Omnium, Heber Valley Circuit Race (Cat 3/4 women), and the Powder Mountain Hill Climb. She held her own in the Utah Crit Series. But to top off the season, she won all three National Championships in the Junior 10-12 division – Road Race, Criterium, and Time Trial! Katie Clouse is our Female Road Racer of the Year. Michael Wilcox (Canyon Bicycles) chalked four wins this year in the weekend road races plus 14 more in the Utah Criterium Series. He tied for the lead in the overall UCA State Championship Series, and finished third in both the overall Utah Criterium Series and the UCA Premier Points Series. Michael Wilcox is our Male Road Racer of the Year. The Larry H. Miller Tour of Utah really came into it’s own this year. The ninth edition of the race was the most spectacular. The six stages took place across the state, drawing 260,000 estimated spectators in person and another 153,000 fans online. The course selection made for a thrilling race throughout, with a dramatic last day determination of the winner on the famed Empire Pass Climb. The race provided a top notch experience for both racers and fans, and is estimated to have had a $17 million dollar economic impact on the state of Utah. The Larry H. Miller Tour of Utah is our Event of the Year. Canyon Bicycles dominated the overall UCA Premier Series Team Points standings, and topped the Utah Criterium Series Overall Team Points standings. They scored points most categories, winning both the A and D flites in the Utah Criterium Series. They had at least 33 wins throughout the region. They also are involved in the Tour of Utah and the Utah High School Mountain Bike League. Canyon Bicycles is our Road Racing Team of the Year. Bonneville Cycling Club members ride their bikes. A lot. In the last year, they rode 172,723 recorded club miles. They commuted a total of 38607 club miles, saving 35518 lbs of CO2 emissions. This year, the club gave $150,000 to breast cancer research, $5000 to the non-profit Bike Utah, $4000 to the Salt Lake County Bike Ambassadors, and $5000 to the Ride 2 Recovery, a group that supports injured veterans. Bonneville Cycling Club is our Touring Club of the Year. They just like to race. UtahMountainBiking.com raced in all of the Intermountain Cup races and all of the Utah State Championship Series races, along with True Grit and others. Along the way, they won the Intermountain Cup Team Points competition again. They bring a lot of riders to the races. And, the club participates in trailwork, and maintains a really cool website that showcases their team and trails throughout the state. UtahMountainBiking.com is our Mountain Bike Team of the Year. The Southern Utah Bicycle Alliance formed in 2012 in response to the rumble stripping of Highway 18 (Veyo Loop) in St. George. Through their advocacy, UDOT reworked the shoulder of this keystone bike route to make room for bikes. They have organized two bike summits, and helped set policy for cycling issues in southwest Utah. The Southern Utah Bicycle Alliance is our Bike Advocate of the Year. Utah again had great results throughout the country. Margaret Douglass (Bountiful Mazda) won the National Criterium Championship in her age group. Evan Clouse (Cole Sport) was second in the Junior National Cyclocross Championship and had wins throughout the region. Katie Clouse won the Junior National Cyclocross Championship and was second in the Junior Cross Country National Championships. Zan Treasure (Bountiful Mazda) won the Marathon Mountain Bike National Championships in his age group and added a 2nd in the Tandem National Championship road race and third in the National Championship Road Race in the 55-59 to his resume. Dina Hannah won the Trona 353 Race in California. Dwight Hibdon won the Marathon Mountain Bike National Championship in the 60-64 age group. Tanner Putt (Bontrager Cycling Team) won the U-23 National Road Race Championship. TJ Eisenhart (BMC) won the Best Young Rider Jersey at the Cascade Classic. Tiffany Pezzulo (Primal Pro Women) finished fifth overall in the prestigious USA Crits Series. Galen Carter won mountain bike races four disciplines this year – cross country, pump track, super-D, and downhill, and raced the Mt. Saint Anne World Cup in the downhill. There were many series champions throughout the state, many of whom are listed in the results section of this issue. They all deserve a tip of the hat. As do you, our loyal readers. You help make the cycling community in Utah the best in the country! Thanks again for another great season. Look for the next issue of Cycling Utah in March 2014. Have a great winter and see you on the bike!